If you follow me on Instagram, you’ll see that I was recently on a dreamy end-of-summer trip in the south of France. My boyfriend Will and I did quite the tour of the Cote d’Azur and Provence and loved each city we visited for its unique culture, food, wine, landscapes, and architecture. 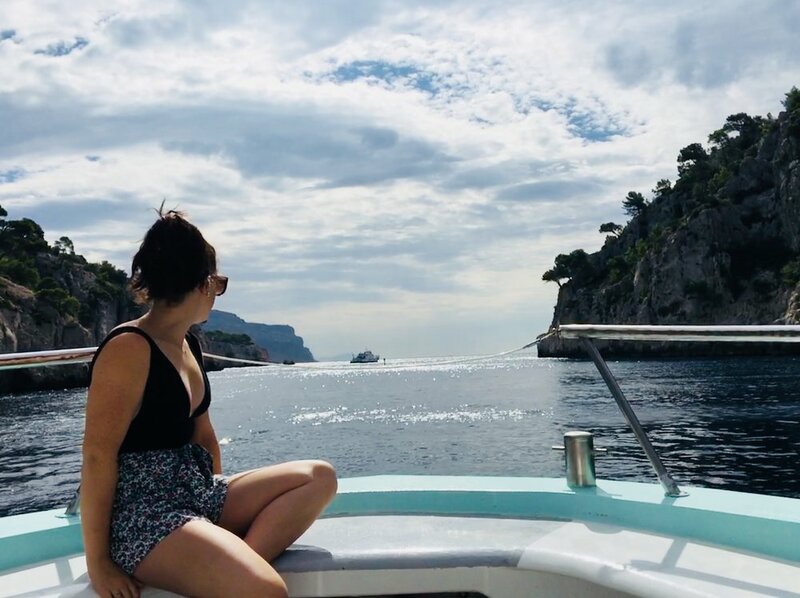 Highlights of the trip were definitely a boat tour of the Calanques in Cassis, shopping in Aix, our wine tour around the villages of Vaison, and lounging on the main beach in Nice. If you are interested in an itinerary of our trip and must-dos, I can write up a more detailed trip post – be sure to comment below! While I had expected to love the historic architecture and absorb the unique culture of Provence (market trips, leisurely meals), I didn’t expect to collect so many wonderful interior decorating trends and inspiration for current projects. My top trends are below. How about you? Are you interested in Provençal design and influence? One of the staples on the streets of Provence are straw totes and baskets. Market days are a big ordeal, so everyone has a large straw tote in hand. Purchasing one was one of my first orders of business and now, back in NYC, I use it as a basket for blankets by the couch. Straw adds a beautiful, light and airy texture to any space, making for great storage, small bowls for collecting knick knacks, or even statement lighting. I loved that the homes and buildings of the Cote D’Azur streets were all neutral bases – whites, beiges, light grays – to reflect the abundant sunlight the area is known for (it didn’t rain once!). However, amongst this basic background there were always small pops of color – usually greens or blues – on window shutters, metalwork, or doorways. These small doses of color add some personality and compliment the surrounding landscape. Perhaps no surprise in a region where local foods reign, there were flowers EVERYWHERE. Market stalls overflowed with fresh cuts and lavender could be found at nearly every shop we went into. Dried flowers were also quite common which are such a great alternative to adding some natural, colorful elements to your home with minimal care. Delicate floral prints are my favorite way to incorporate this trend – especially through textiles and wallpaper. I mentioned it earlier, but the ritual of a meal, particularly dinner, is a sacred daily routine. All shops and businesses close promptly at 7p and restaurants open to begin serving dinner at 8p. Dinner lasts all night; 3 course meals with no shortage of wine and coffee were standard at nearly every restaurant we went to. Because of the importance of meals, both for appreciating food and drink but also for the social element, tableware and accessories are staples of markets and shops. It inspired me to hone in my own collection and consider the functionality of all of my tools.